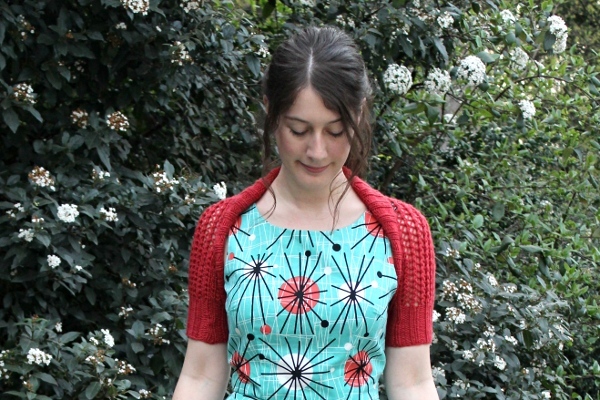 To be honest, I didn’t make it especially to go with this dress, but I started it last summer and then forgot it in my knitting bag. 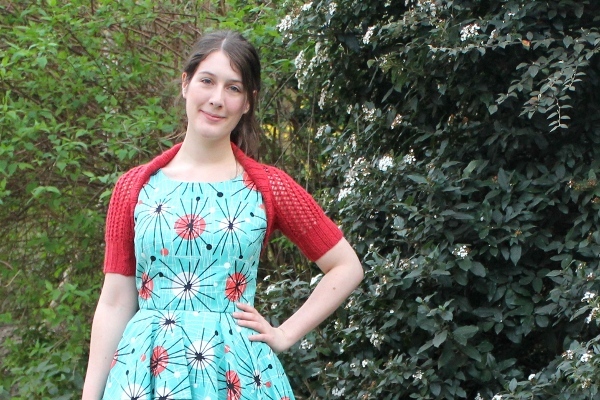 When I started the dress, I realised it would go perfectly with it, so it gave me the boost I needed to finish it. My first attempt at knitting a shrug (cf. post in French) had left me sceptical: it is pretty, yes, but I can’t wear it with any of my dresses, and on the practical side, well it’s not very much warmer with it than without it. I’ve only worn it once, twice maybe counting the day I took the pictures. For this one I’m hopeful however. First because it is larger and thicker so it should be a welcome addition to summer dresses when it’s windy or it’s getting late. Also because the shape looks better with the dresses I have. 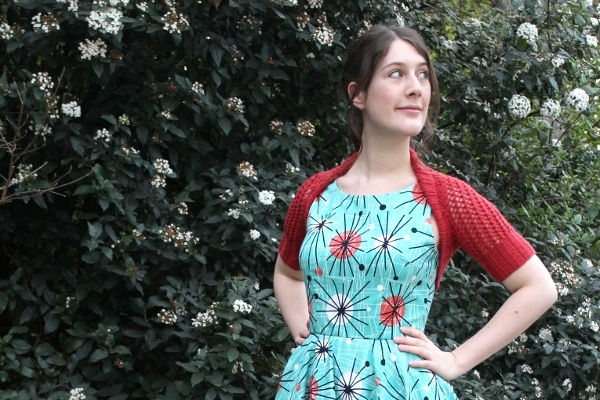 The pattern is the Retro Redux Shrug from Lace Style. 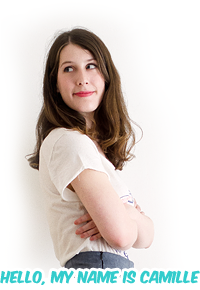 It is really simple to make, with a short-rows collar that folds nicely. I made it in Malabrigo Worsted, in the American Beauty color, which is some sort of mix between red and orange (I had already made a beret in the same yarn). 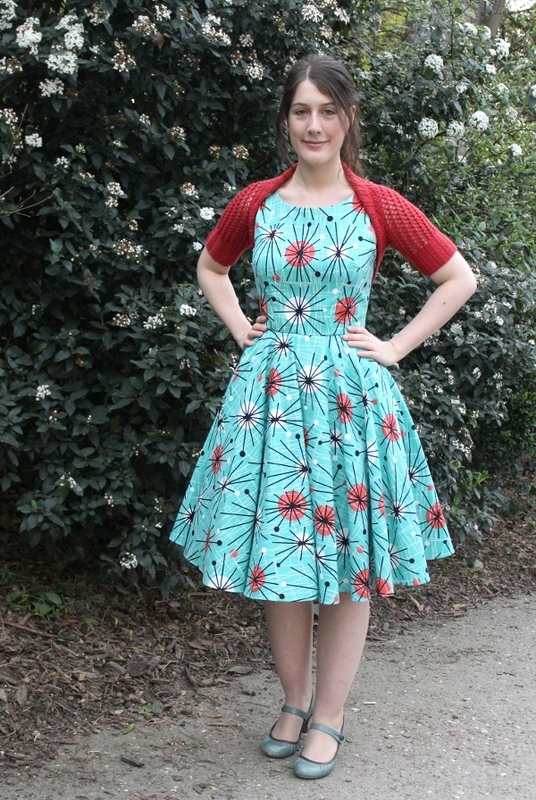 I’m so glad I finished it, because it goes perfectly with the Atomic dress: the back is just large enough to cove the low-scoop back of the dress. So pretty! I love the colour and it goes perfectly with the dress. 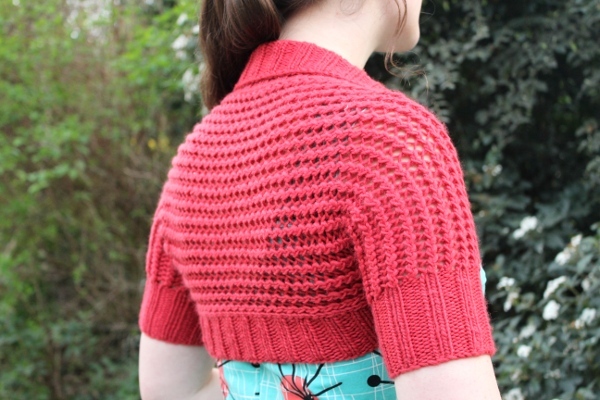 I have been searching for a good shrug pattern and I think this is the one! I truly recommend it, it is so easy to make! This is AWEsome!! The dress fabric is great, and together they are perfect. Well done.